The vigilant anesthesia monitoring during surgical or interventional procedures (diagnostic or therapeutic) reduces the potential for poor outcome by identifying derangements before they result in serious or irreversible injury. To ensure the adequacy of the patient's circulatory function during all anesthetics, the electrocardiogram (ECG) should be monitored from induction to recovery from anesthesia till shift out from postanesthesia care unit. The ECG is a fundamental cardiovascular diagnostic tool for monitoring perioperative heart rate and rhythm abnormalities which can be immediately dangerous, if not promptly treated, such as severe bradycardia, new atrioventricular blocks, and ventricular tachycardia or fibrillation., The cardiac electrical activity spreads throughout the body and can be recorded at specific sites on the body surface using electrodes after being amplified, filtered, and then displayed as ECG signals. 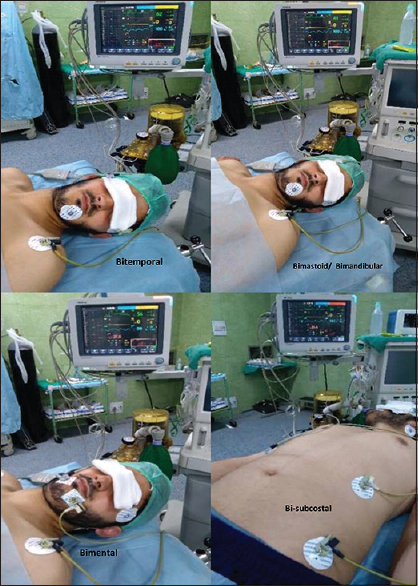 Unwillingly, the lead positions may remain the concern in some situations such as if lower torso is not under the reach of anesthetist/intensivist during the lower torso procedure/interventions or burns and similarly, in cases where the upper torso is not under the reach of anesthesiologist/intensivist during head and neck or upper torso surgery or upper body burns, and/or if the patient is in prone position. Keeping in view such scenarios, we defined the different substitutes for conventional lead placements while using 3-lead ECG monitoring for constant vigil of cardiovascular function. Gupta et al. shifted the right arm (RA) and left arm (LA) electrode on both sides of the forehead, respectively, and that of the left leg (LL) to the left shoulder for ECG monitoring. The relocation of standard limb lead positions to the trunk and placing the limb electrodes on the anterior acromial region (shoulder tip) and anterior superior iliac spine (ASIS), allowed easier and more rapid ECG acquisition in emergency settings with minimal motion artefacts but was associated with abnormalities of R-wave amplitude (specifically an increase in lead II, III and aVF and decrease in I and aVL). These lead positions are not recommend for routine use but can be a reasonable alternative for recording ECGs if application of the standard lead is difficult in an emergency as described by Takuma et al. Instead we collected the ECG information with accuracy by placing the RA and LA electrodes correspondingly at a). Bitemporal/Bimental/Bimandibular/Biparietal/Bimastoid/ Bioccipital/ or Bimaxillary on parallel side respectively and LL electrode was placed parallel at or along left shoulder (including arm) as far as downwards up to the toes or b). Bilateral subcostal margins on matching parallel sides respectively and LL electrode placed parallel at or along left anterior superior iliac spine (ASIS) up to toes [Figure 1] and [Figure 2]. Conversely, the ECG data, the cardiac electrical activity analysis became poor at and below bilateral ASIS down the left leg up to the toes. The reason for the poor ECG data may be due to the poor conduction of cardiac electrical activity secondary to the high resistance of skin and abdominal viscera below the bony subcostal margins. [Figure 2]. 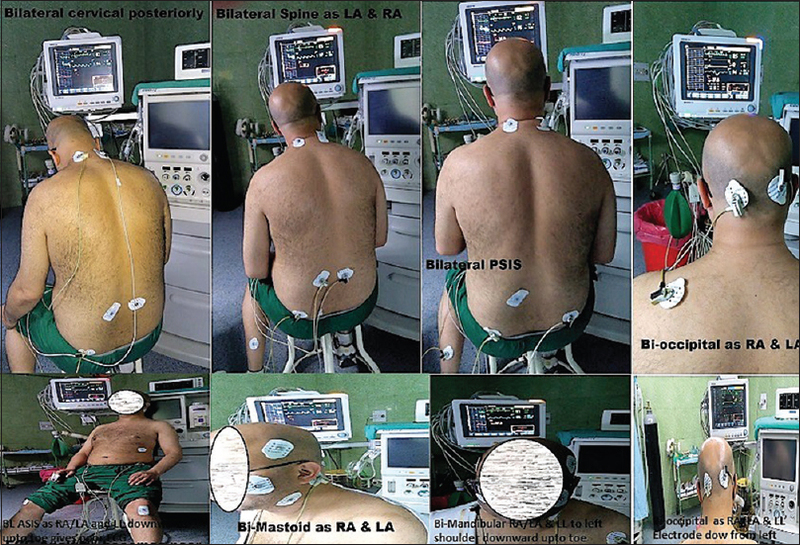 Surprisingly, the ECG analysis was maintained along the bony back on both side of the spine from cervical region up to the sacral region or posterior superior iliac spines (PSIS) by placing RA and LA electrodes along the corresponding sides and LL electrodes placed on or along the left leg up to toes [Figure 2]. Hence, we proposed a model of cardiac bio-electromagnetic vectorography/vectors (CBEMV) in such a way that we can transfer and interpret these vectors along the cardiac bio-electromagnetic field (CBEMF) for ECG interpretation using standard limb leads by placing electrodes along the corresponding CBEMF vertically from top to toe, but the ECG analysis became poor below the subcostal margins anteriorly [Figure 1] and [Figure 2]. However, it may also hold true for augmented limb leads [aVR, aVL and aVF] and Chest Leads [V1-V6], which needs yet to be examined. We, therefore, suggest that the planar concept of electrocardiography to be conceptualized as three-dimensional model of CBEMV and/or CBEMF along the X, Y, and Z axis, which also needs to be put to the test. The authors would like to acknowledge anaesthesia residents (Dr. Shahnaz, Dr. Mehnaz, Dr. Khurram, Dr. Areeba) and CVTS resident (Dr. Rouf), Trainee OR Technician (Mr Umer), Staff of CVTS ICU (Sister Sabeena). Standards for basic anaesthetic monitoring. Committee of Origin: Standards and Practice Parameters. American Society of Anesthesiologists. (Approved by the ASA House of Delegates on October 21, 1986, last amended on October 20, 2010, and last affirmed on October 28, 2015) https://www.asahq.org/~/media/Sites/ASAHQ/Files/Public/Resources/standards-guidelines/standards-for-basicanesthetic-monitoring.pdf [Last accessed on 2019 Jan 18]. Kligfield P, Gettes LS, Bailey JJ, Childers R, Deal BJ, Hancock EW, et al. Recommendations for the standardization and interpretation of the electrocardiogram: Part I: The electrocardiogram and its technology a scientific statement from the American Heart Association Electrocardiography and Arrhythmias Committee, Council on Clinical Cardiology; the American College of Cardiology Foundation; and the Heart Rhythm Society Endorsed by the International Society for Computerized Electrocardiology. J Am Coll Cardiol 2007;49:1109-27. Landesberg G, Hillel Z. Electrocardiography, perioperative ischemia, and myocardial infarction. In: Miller RD, Cohen NH, Eriksson LI, Fleisher LA, Wiener-Kronish JP, Young WL, editors. Miller's Anesthesia. 8th ed., Ch. 47. PA: Elsevier Saunders; 2015. Gupta S, Paliwal B, Kumar M, Bhatia P. Alternative electrocardiography electrode placement. Anaesthesia 2018;73:525. Takuma K, Hori S, Sasaki J, Shinozawa Y, Yoshikawa T, Handa S, et al. An alternative limb lead system for electrocardiographs in emergency patients. Am J Emerg Med 1995;13:514-7.